We were concerned about the availability of food in some of the more remote parts of Scotland, especially as the Scottish Hostels don’t offer meals. We therefore decided to carry out a “Supermarket Sweep” this morning and post on some food parcels to the Scottish YHA’s. Although examining chocolate bars for calorie content, it made a nice change to be selecting chocolate snack bars with the highest calorie value. Eventually we left Sainsbury’s with 180 Brunch Bars and 80 Cadbury Boost’s for our Scottish food parcels between the 4 of us. Following our shopping trip, a late start to the cycling at 11:30 but with a strong tail wind we made very good time to Taunton, sustaining around 25mph for much of the way in our close formation 4 carriage express, and boy did it feel good!. At Taunton we joined the Sustrans National Route 3 for much of the rest of the day, following the canal route out of Taunton and onwards to Bridgewater. The NCR route markings were very poor, especially around Bridgewater, and we eventually got lost and ended up underneath the M5 motorway flyover. There were remains of burnt-out cars and the whole area was like something out of Mad Max and the Thunderdome! Eventually resorted to “Gladys” our if all else fails mobile GPS unit to show us the way out and we progressed through the Somerset levels, in the rain, to our wonderful Yatton hosts, Bill and Pat Sales. Well fed and watered Keith and I shared a double bed, (not for the last time on this trip), while Mark was banished to his own room far enough away so that the rest of us would remain undisturbed. Food – We took a snack in the restaurant of a garden centre at Waterloo Cross (where you join the A38 at Sampford Peverell) which was really good. Lunch today was in the Tesco’s in the centre of Taunton that very handily sits right on the NCR. We soon discovered that you can’t really go wrong with the store café’s in Sainsbury or Tesco, where a full English breakfast for less than £3 is a lot more value for money and tasty than the YHA offerings. The Route – Well we did have huge problems today with the NCR markers. One important one we missed was smaller than a standard cigarette packet. 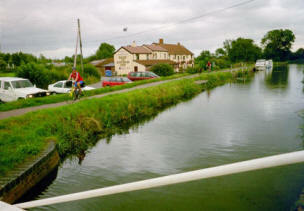 The canal path, which is part of the NCR3, is a bit tough and slow on roadbikes due to the surface but still passable. I didn’t enjoy today’s route as much as the first 2 days although it was a lot flatter and would probably try a different route next time from Taunton North. (Spot the Sustrans NCR3 sign (4th rail from the right). The approximate route we followed for Day 3 is listed below (1:50 000). From the YHA, come out of the main gate and turn L to junction with A379 where L. Straight over at the large roundabout and follow off road cycle track uphill which joins the A3015 after the slip road. Continue straight over the next roundabout where the road becomes the B3181 sign posted to Broadclyst and Cullompton. Follow B3181 to Sampford Peverell and turn R onto A38. Follow A38 until you get to the roundabout just before Wellington where you can take the first exit that takes you through Wellington, or carry on the A38 that bypasses it. Rejoin the A38 and follow into Taunton. Pick up NCR3 in the centre of Taunton near Tesco’s which follows the canal path, apart from a short section of about a mile, all the way to the Boat and Anchor pub just before the canal goes under the M5. Carry on following the canal under the Motorway and after about 300Metres turn right away from the canal and follow a cycle path towards the railway line. The cycle path actually goes over the bridge over the railway although it is very badly sign posted. After the railway carry along the path under the Motorway again, past Dunwear and across the A372 towards Chedzoy. L in Chedzoy through Stape X and on to the A39 where R.
R onto B3141 and through Woolavington, East Huntspill, Watchfield and Mark. After Mark first L to Chapel Allerton and then L to A38 at Lower Weare where R. Follow A38 through the pass between the hills and take the L near the top and follow lane to Winscombe. In Winscombe take L off A371 to Sandford. Straight across A368 and follow lane to Churchill Green where L to Brinsea and Congresbury and Yatton.